Silicone caulk is a high-end caulk product meant for areas that are likely to be exposed to water. It lasts longer and is less likely to degrade than latex or acrylic caulks, resists mildew and is unlikely to discolor or turn yellow. This caulk also adheres well, has good flexibility and dries transparent, making it attractive on most surfaces. However, silicone's water-resistant characteristics also mean it's difficult to paint over. Silicone caulk often requires special paint or surface preparation before painting. Conventional house paint works on silicone caulk that has been treated with painter's caulk. According to Online Tips and The Natural Handyman, oil-based paints and primers are more likely to stick to silicone caulks than latex or acrylic paints. The caulk must be very clean and should be prepared using denatured alcohol. This alcohol can roughen the surface of the caulk, creating nearly invisible pits and crevices that allow the paint to stick more effectively. It is sometimes necessary to apply the alcohol several times to create a surface rough enough to paint. Primers based on shellac, a material produced by the lac beetle, may also adhere to silicone. As with oil-based paints, roughen the silicone caulk by applying denatured alcohol before painting it with shellac. 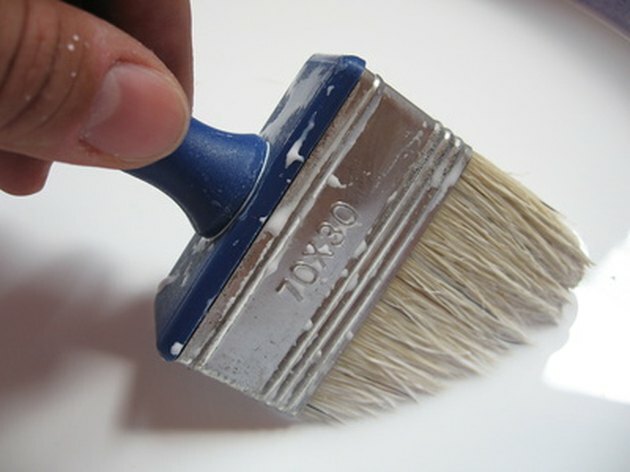 Denatured alcohol is also used to thin shellac-based paints but should never be applied to a finished shellac coating since it may dissolve the base. Unlike oil-based paints, shellac paint is fairly inflexible; don't use it on areas that need to bend or that come under pressure. Applying conventional latex paint to untreated silicone caulk normally results in poor adhesion and an unattractive finish. However, according to T.L.Hart and Online Tips, acrylic paint will stick to silicone over which a layer of siliconized painter's caulk has been applied. Ensure that the caulk is very clean and completely dry before applying the painter's caulk -- the coating is unlikely to stick to a dirty or damp surface. Apply latex primer or paint as usual.